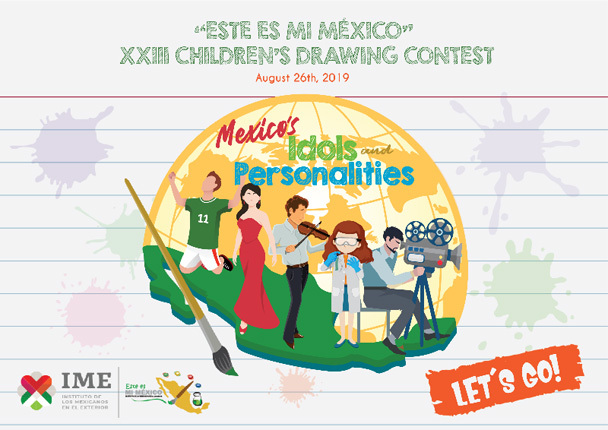 The Ministry of Foreign Affairs of Mexico invites children of the East Caribbean region between 6 and 14 years of age, to participate in the XXIII Children’s Drawing Contest “This is my Mexico”. The subject of this year’s contest is “Idols and Important Figures of Mexico”. Every year thousands of children from around the world participate in the competition. Forty winning entries and twenty-eight honourable mentions will be selected and will take part in the itinerant exposition, which will be inaugurated in Mexico City and exhibited throughout the world by Mexico’s Embassies. To participate, interested children must create a drawing (with brush, pencil, acrylics, watercolours, crayons or other materials), complete the Registration Form and paste it on the back of their entry (cardboard 297 x 420 mm or 12” x 12”).